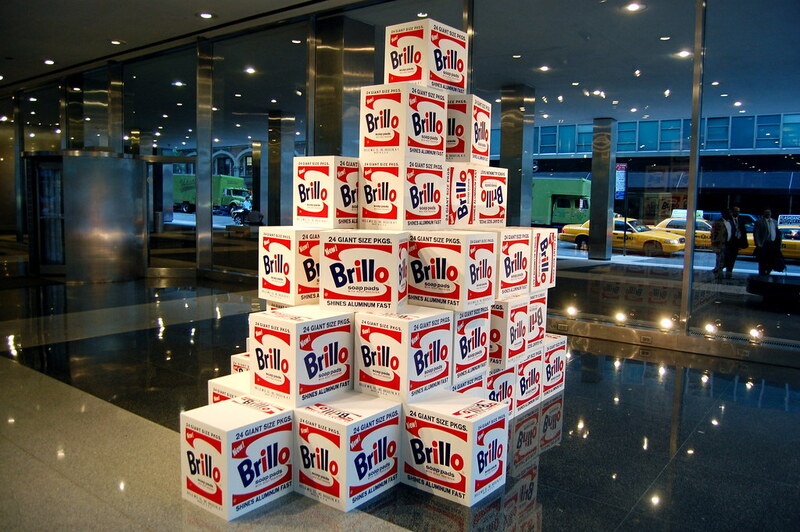 Having only seen Warhol’s sculptures displayed in regular grids, their mutability only occurred to me after a trip to the Lever House, where collector Aby Rosen has put Mike Bidlo’s faux Warhol Brillo Boxes on display. Check out the three pieces that are turned on their sides! (There’s even one that is upside down.) I also hadn’t realized that some sets of the boxes were sold (or at least authorized) in complete editions of ten or more. Single boxes, like this one, which was once in the collection of Swiss dealer Bruno Bischofberger, turn up at auction occasionally. 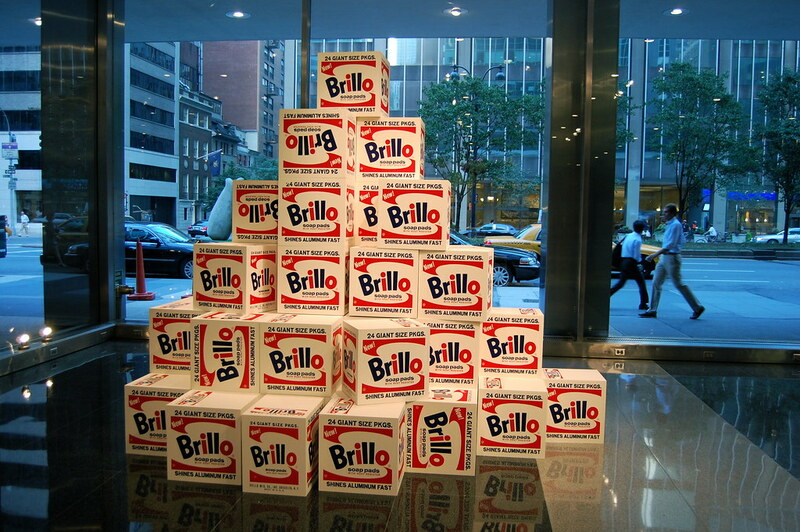 For a thorough look at the various editions of the Brillo Boxes, Greg Allen is the key source. He also links to The Moment’s interview with Bidlo, who briefly describes the various versions of the work, proving that appropriation artists tend to be the most discerning connoisseurs. Charlie Finch has also weighed in, detailing Rosen’s “champagne vernissage” for the lobby show, which was attended by philosopher and Brillo Box expert Arthur Danto. Finch calls for a reevaluation of Bidlo’s work, and asks, “Is Mike Bidlo ready for his auction moment?” This much is clear: if a Bidlo Brillo Box ever beats the price of a Warhol Brillo Box in an auction room, it is going to be a very special day. 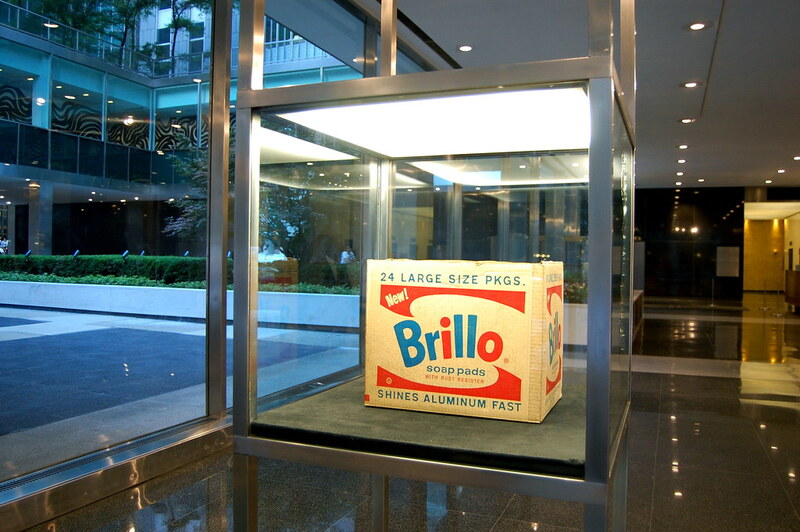 A real Brillo Box is securely enclosed in glass in the Lever House lobby. Mike Bidlo, "Not Warhol (Brillo Boxes, 1964)"